Whit is a native of Wayne County. He grew up in Fremont helping on the family farm and graduated from Charles B. Aycock High School. 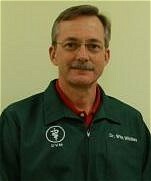 After attending N.C. State University for his undergraduate studies, Whit graduated with high honors from Auburn University School of Veterinary Medicine in 1979. Whit returned to Goldsboro in 1979 to become a partner at Berkeley Veterinary Clinic. He finds challenges in all facets of veterinary medicine but his greatest interest involves dog and cat internal medicine. He is married to Candy; who is a busy housewife and active volunteer in her church. They have two sons (Wyatt & Benton). Wyatt is a Certified Registered Nurse Anesthetist with Vidant Healthcare in Greenville. Wyatt's wife Kori is a physician with Greenville Obstetrics, Gynecology, & Pelvic Surgery. Benton is a graduate of the University of Michigan School of Musical Theatre. Benton is currently a partner with Stewart/Whitley, a Broadway casting company in New York. Dr. Whitley has two miniature Dachshunds (Gertie and Boo).